Last night's Warriors-Nuggets game ended the way you'd expect it to end when the Nuggets play atrocious defense and the Warriors shoot somewhere around 125 percent from the floor. But the bigger factor–bless his heart and his shaky ankles–was Stephen Curry finally getting a chance to show us what he's made of on a big stage. Before last Saturday, Steph Curry had never played in a NBA playoff game, a circumstance that was disheartening to those of us who are enthusiasts of his game. His inaugural postseason performance, on Saturday, was uneven and left much to be desired, but last night Curry gave us what we had been waiting for: a truly memorable playoff performance. Curry finished the game with 30 points and 13 assists, which puts him in rare company. It wasn't the most impressive game that Curry has ever played, but it was one that exemplified the best parts of his game. He shot zero free throws and only scored one basket in the paint, because Steph Curry doesn't need to get close to his opponents in order to eat their hearts. He can spend the game floating around the perimeter like a ghost, whipping passes, throwing crossovers, and squeezing off gorgeous jumpers in the blink of an eye. He's Reggie Miller with handles. He's Ray Allen with court vision, and he is impossible to stop when he plays like he did last night. The night so thoroughly belonged to Curry that not even a rolled ankle—the same cruel injury that has haunted him throughout his career—could sideline him. For a moment, it looked as if Curry's playoff arrival would be cut short, but after a few minutes on the bench he returned to the floor in the fourth quarter to ice the game with four more assists and one final, perfectly arced three-pointer. Curry's ankles will always be troublesome, and the Warriors don't offer much hope that we'll ever see him as part of a perennial playoff team, but none of that mattered last night. It was just nice to see Curry finally getting a chance to unspool his greatness in a truly meaningful game. 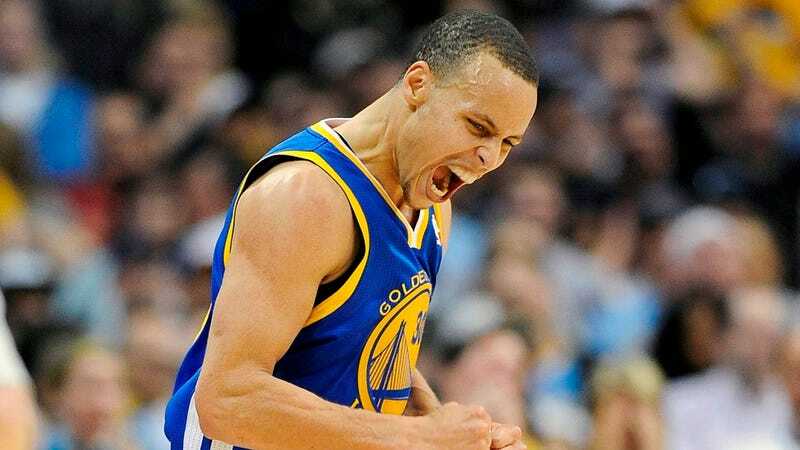 Steph Curry is in the playoffs, finally. We should enjoy it while it lasts.